Knorr Hickory Smoke BBQ Sauce is the ideal pour-over sauce for popular grilled dishes such as Hickory Barbeque Chicken and Grilled Salmon. It can be used as a marinade, or as a dipping sauce for fried food. Tomato Paste, Sugar, Vinegar, Soya Bean Oil, Spices, Salt, Nutmeg, Permitted Flavourings, Edible Gum, Mustard, Caramel and Permitted Preservative (E211). All food additives used are of plant and synthetic origin. May contain traces of fish, celery, egg, peanut, mollusc, sulphite. 1. 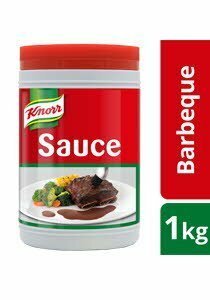 Use as a marinade - use 100g of Knorr Hickory Smoke Barbeque Sauce with 500g meat and marinate for at least 2 hours before cooking. 2. Use as a basting sauce - use 40g of Knorr Hickory Smoke Barbeque Sauce with 200g meat. 3. It can also be used as a dipping sauce.